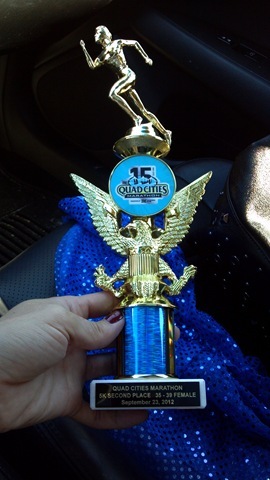 My Medal vs Your Medal….. I told her that I had placed in my age division for the 5K. She immediately looked sad and said, “I’m really slow, I run a 12 minute mile”. It absolutely broke my heart. I hear this all the time. It almost always comes from someone who just ran a very LONG race, and the person can’t yet appreciate the mere accomplishment of finishing something so grand. So many compare themselves to others and assume that what they accomplish means less because they ran a slower race. In reality, when we all run the same race and cross the same finish line then we receive the same finishers medal, regardless of pace. 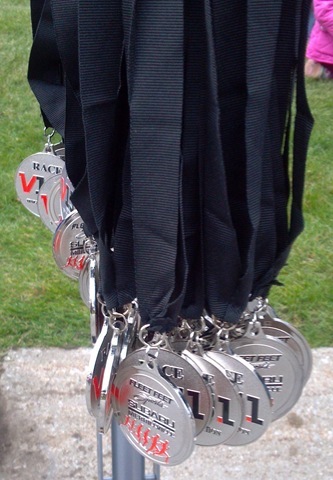 It’s not a mistake that race officials handout these medals in mass. It’s not a mistake that the finisher medals from an event all look the same. We have just accomplished the very same thing. Be proud. Hold your head high, no matter how fast or slow you covered the miles. It took a lot of hard work to even toe the start line so bask in the glory of your accomplishment. You earned that medal, wear it proudly. It’s the same one I have, you know. This entry was posted in Running and tagged Be proud of your accomplishment, Be proud of your pace, finisher medals, Running, we all get the same finisher medal regardless of pace by tootallfritz. Bookmark the permalink. Almost always someone faster, right? And someone will eventually be faster than Mr. Bolt too! I wish they would have more 5K run/WALK events for people like me who can’t run. I still enjoy the “I did it!” feeling, even though I’m only walking. We have quite a few run/walk events in Illinois. The big races now even try to offer something shorter and more relaxed so the entire family can participate. I’ll look around for your area, but I know that all of our local 5Ks are very walker friendly. I also have several friends who run/walk. They run when they can and then walk when they need it. I think the races are more about fitness now and it shows in the growing number of people who participate. That’s a fast 10K for a kid! Or most of us, really! Amazing seeing these kids run for the love of it. I wish I had apprecaited and loved running when I was a kid. Unbridled passion for running, pure fun! Great photos! And I love that he was right up and the front at the start, knowing he belonged there. Awesome! So so so true! After running all the races that I have, my most hard-earned medal is from the 2010 Southwest Half in Palos. I finished in 2:48. Yes, it’s my slowest half finish time ever. But it was also my hardest race ever. I’m super proud of the medal from my PR half, which was 55 minutes faster, andI worked hard to achieve that PR, but my first half, no matter how slow, was mentally the hardest thing I’ve ever done. I wanted to give up. I walked the last 5 miles. S just crossing the finish line that day, even though I was in the back of the pack and “slow,” was such an exhilarating accomplishment. We all need to do a better job remembering that the number/time they give us at the finish line is just a minor representation of the effort, sweat and tears we put into toeing the start line. Pace and finish time are just numbers, participation is an event. TTF…that’s a sweet and compelling story. At this point in my life had I been in your shoes…I might have offered her my trophy and tell her she is just as good as me…irrespective of the speed. I joke about it often and say “speed is relative!” I am not sure everyone understands entirely what I mean by that, but what I try to use that phrase to summarize is that our speed is dictated by many factors. Age, weight, VO2max, regimen of training load and intensity and so forth. But her 12:00 min mile pace is relative to the others far faster than her. She may have ran slower, but she probably worked harder, taking longer and maybe burning more calories than the speedier runners. Maybe she wasn’t running at or close to her “maximal” aerobic capacity, but then again she probably doesn’t have the training/conditioning to reach that threshold. But…she was probably running that half-marathon as fast as she could and working hard to do it. In a general sense…the speedier runners are usually lighter (a matter of physics) and have the training that puts them running at their maximum aerobic potential at or just below lactate threshold. Too bad we didn’t have Heart Rate data for that lady versus a few other runners that ran faster. You can see it there….speed is relative! I would have told that woman not to be disappointed cause she just ran 13.1 miles. And irrespective of speed….there are a lot of people out there that can’t accomplish that kind of endurance. Thanks so much for this post. It’s so easy to get caught up in the times and lose focus. I’m running the Chicago marathon next weekend and hope to finish in 5 hours. That seems like a really “slow” pace to some, but for me it’s about the months of training and FINISHING my first marathon and not about the time. Good luck, you’ll do great! Just keep moving toward the finish! Thank you thank you thank you thank you THANK YOU for this post. I am one of the slower runners out there and I struggle with this feeling all the time. It bothers me a lot when I read blog posts from other runners who finished their races in almost half the time I did, yet complain about how slow they are, then make inconsiderate remarks about the back-of-the-packers. You are a beacon of wisdom and inclusion! Great post. Every word of it true!! Geez, you seriously made me tear a bit. (granted I’m an emotional mess today for reasons that escape me though). You are so right. Its hard to remember. Comparison really is the thief of joy. When I get down about my pace I remind myself there will always be people faster, but there are also people who aren’t doing a thing. Great post! I’m a slower runner too. I’ve never placed, I try, don’t get me wrong, but I run for me, to prove to myself that I can do, so the finishers medal means more to be than anything! You’re humble! Thank you! Even though you’re way faster than me, I still want to do a race with you! Maybe for when I run in your neck of the woods! I would love to do a race with you! I run with people of different places, all the time. I just enjoy the running and the camaraderie! Thank you! And everyone who puts themselves into the “slow runner” category — if you keep working at it, things will get easier! You’ll start to run farther, easier, faster. It may take a while, but it will happen. Have hope, and try to remember why you run. I hope you enjoy running for running, and remember the people who may not be able to run. Thanks Amanda! I couldn’t agree with you more. I just shared this with a friend that registred for her first 5K. She was afraid to sign up b/c she thought she would be too slow. I tried telling her the same thing but hopefully your words will help as well!